A mobile app should work without a signal right? Well we have been improving ours so that it does just that, and furthermore, you can continue working all day and as soon as the phone picks up a signal it will send the details back to your office. In today’s post were going to talk about our own mobile app that has been recently updated. The last few weeks have been rather hectic to say the least! So much so, we have run a little late on our blog updates, so here’s an update on where we are with the new mobile App. 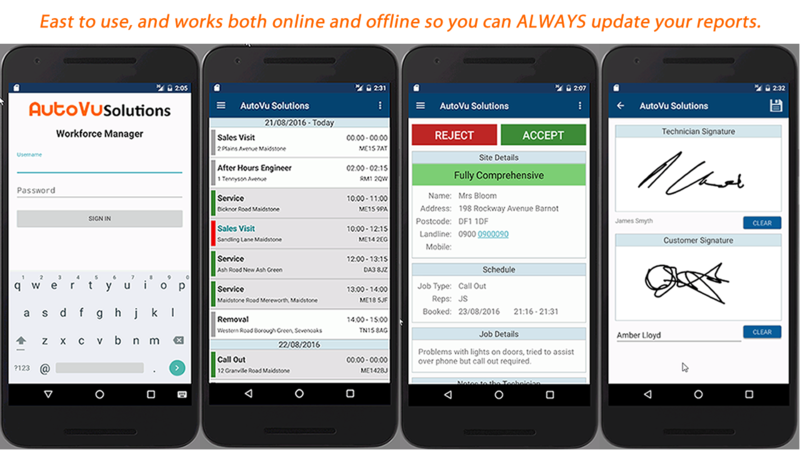 For a long time we have prided ourselves on the fact that the AutoVu Field Service Management and CRM system can be viewed on both a full screen PC or Mac as well as instantly responding to mobile device and tablet screen sizes. It’s worked very well and is something that we will continue to develop allowing full access to your system from wherever you are. This also includes the ability for sales reps and service technicians to update on-site reports and upload pictures and documents. A question frequently asked ‘But what about areas that have no signal’, and now finally answered. We have developed our own in-house solution to the same high standard as our main AutoVu platform. Yes, we could have easily adopted a third party solution as do many other platforms, but we like the flexibility to adapt and respond to our customers when change is required. So here it is, the shiny new workforce manager that’s incredibly easy to use, very fast and stays logged in even when your in a poor signal area. Your engineers and sales reps can continue working throughout the day without ever losing customer name and address details, can always get a signature, and can update their job report as soon as they have finished. The details will be automatically sent back to your office in the background even if the app has been closed. Were very pleased with the App and hope you will be too, so give it a try. Its free to download and currently available for Android on Google Play, just search for AutoVu. Furthermore, you can sign up one free user and use it for as long as you want, additional users can be added to the basic package for £18 per month. If you would like to know more about our new app and how it can help your business, please do get in touch.